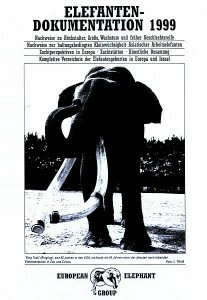 In 1993, 1997, 1999, 2001, as well as in 2002, the European Elephant Group published in cooperation with the association ELEFANTEN-SCHUTZ EUROPA e.V. 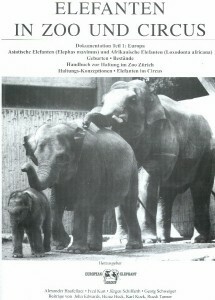 [PROTECTION OF ELEPHANTS EUROPE, registered association] altogether 5 extensive, well-founded and critical documentations dealing with “Elephants in the zoo and in the circus“ and containing reports on keeping facilities, breeding, elephant populations, etc. in Europe and North America. These documentations contributed to the fact that especially zoos reassess and rearrange their elephant keeping. 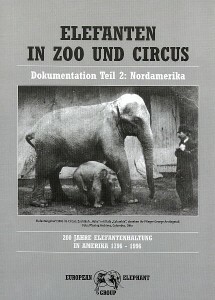 The documentation 2001 provides evidence that a keeping of elephants, which is appropriate to the animals, is not possible in a travelling circus. The documentation 2002 includes an analysis to the Oxford study. 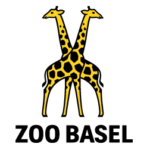 The documentation 2002 was translated in English in cooperation with the Federation of Zoological Gardens of Great Britain and Ireland. 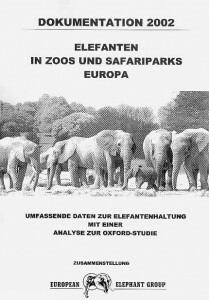 It is the most comprehensive data base of elephants in Zoos and Safari parks in Europe and was translated by Dr. Mauvis Gore, UK and Olaf Paterok, Germany. 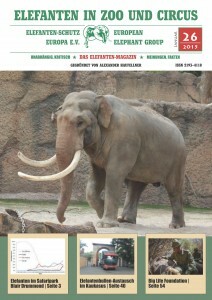 It can be ordered by Schüling Verlag (www.tiergarten.com) and costs Euro 40,–. 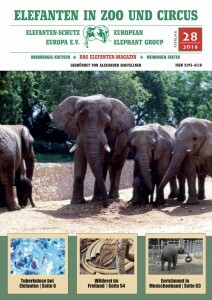 Please read the Book Review of the Documtation 2002 in the International Zoo News, Vol. 51/7 (No. 336), 2004. It is the objective of our work with extensive investigations, to enable for the wildlife elephant a worthy life in human hand, which is largely adjusted to its natural patterns of behaviour. Also in the future we want to support this objective vehemently and by topical, periodical publications (half-yearly) we want to help all elephant keepers and elephant lovers to understand this objective better. The Web page and the documentations are written in German. 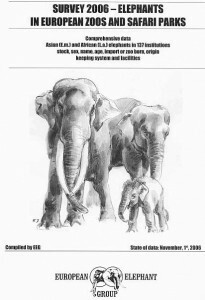 The many impressive pictures and population lists make the documentations interesting also for English-speaking elephant lovers. 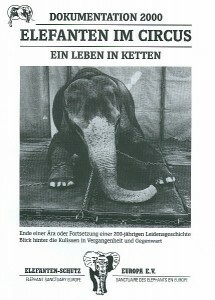 Association ELEFANTEN-SCHUTZ EUROPA e.V. 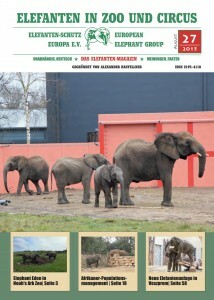 [PROTECTION OF ELEPHANTS EUROPE, registered association] in cooperation with EUROPEAN ELEPHANT GROUP. Price for 2 issues per year: 16€ including postage/forwarding. The subscription can be cancelled at any time.